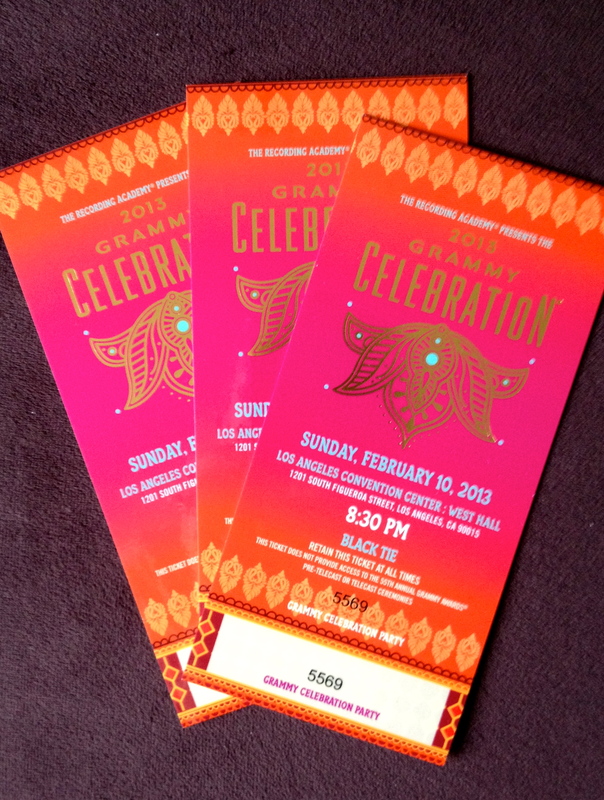 One of my guests left me three tickets to the Grammy after party this year. He was the manager for Fun. His clients all together had won eight Grammys that night. Brad and I raced home as soon as we could. We got all glammed up in about four and a half minutes. We were out the door and on our way downtown by 11:45pm. But the party ended at midnight. (Who knew rockstars went home so early??) We were too late. We found a late night place to grab some dinner instead. I barely said a word on the way home. I realized in the three years we have lived in Los Angeles, I hadn’t come much closer to really being invited to the Grammys. I had gotten so excited about the chance to be involved in any part of the show, and then I had been completely shut down. And it felt awful. I realized that I had these dreams and goals since I was a child to work in the music business, and somehow I was just letting them come down to chance. I was doing all of these other things in other areas of my life that seemed to work, but I wasn’t doing the one thing that I really shine at. When I moved to LA, I thought getting all of my possessions from one coast to the other would be the hard part. After two scary months of applying and interviewing, I finally found a job to pay the bills. I started learning about wine and driving around Los Angeles to sell it. And it was fun, so I kept doing it. Then Brad started making some really exciting food. And with all I was learning about wine, I got really excited about the restaurant industry. We started talking about opening restaurants together and making this our life. And when the wine job disappeared, the restaurant industry was waiting for me again with open arms. So I kept doing that. But after a few years (yes, it took me that long), I realized that while it was fun, it paid the bills, and I was good at it – I had been neglecting something all along. Seeing Brad’s determination in these past couple of months is a kick in the pants for me. I am also great at something. I spent my whole life working up to a goal and learning the ins and outs of a business, but the minute I stepped into Los Angeles I got completely distracted. Not by shoes or drugs or whatever else people get distracted by. I got distracted by life. So now I am pulling myself back together. I’m back on Craigslist and back to networking with the people I know. I am getting back to what I’m all about. What makes me tick. What excites me. It kills me to live in a city with so much musical activity that I’m not a part of. LA is a city with so many musically creative people. I want a piece of that pie, and I want it bad. I want to surround myself with people who appreciate new artists and new sounds, who make me write down album titles that I race home to listen to. Today was an exciting day on this front. I just wrote messages and emails to people asking them for advice and inspiration, but it made me feel like it was one small step back to where I’m supposed to be. One small step toward the dreams and the goals that I’ve had for most of my life. I’m not sure where my place in the industry will be, but just reaching out to those people and knowing that they are there – knowing they made their creativity their career – makes me hopeful. So, if you know anyone in the music industry who would love to talk to a lovely blogger about the Los Angeles music scene, send them my way. Thank you!! You know, that’s a good point. I chose the title “Key of Kels” in regards to musical keys (the key of E minor, etc. ), so it seems that I subconsciously have had music on my mind the whole time. Another sign! Thanks for pointing it out to me:) Onward and upward!